On the afternoon of Saturday 16 July 2018, Revd Trevor Jamison was inducted as our minister at St Columba’s, alongside wider Church duties across the Northern Synod. Trevor is no stranger to the North East, having previously served in Northern Synod in the early 21st century as Adult Education Officer. During the service, he reflected that whilst one can never go back to an earlier time, one can draw wisdom and inspiration from past experiences. Induction is ultimately about serving God, and Trevor reminded us that we are all important to God, and urged us to love other people and creatures, in thought and in deed. 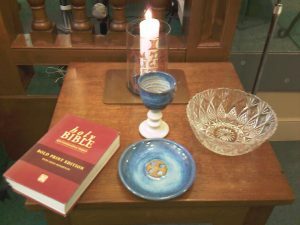 During the service, gifts of a Bible, a plate and cup, and a bowl of water were presented to Trevor, representing his ministry of preaching the Word of God and administering the sacraments of communion and baptism. 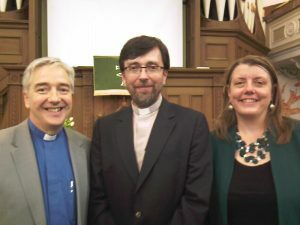 The sermon was preached by the minister of Augustine United Church, which Trevor and his family attended whilst he was working in Edinburgh. She spoke of their many gifts and asked us please to treasure them well. She also encouraged us to ask him lots of questions! Readings from scripture offered a vision of hope for a “new” North Shields, indeed a whole world transformed, where people live together in peace and dignity, enjoying the fruits of their labour, in harmony with nature. On our journey of faith together, we can each bring our own talents and diversity. Jesus showed a new way to lead, by serving others and helping them when they were in need. The service was attended by many members and friends of St Columba’s, ecumenical partners, civic leaders, and members of Synod, who brought warm words of welcome. 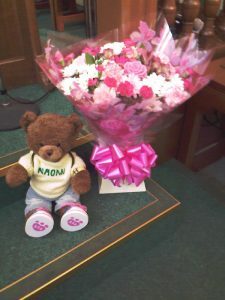 (Synod’s travelling teddy bears, Naomi and Elijah were also there!) 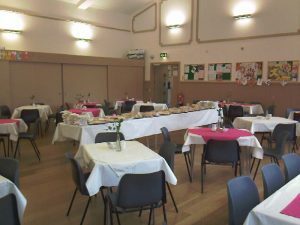 Afterwards, the church hall filled with people enjoying a huge buffet and meeting and chatting together. 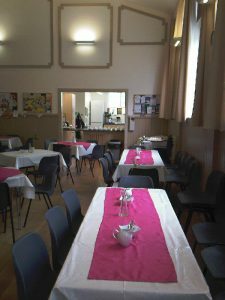 St Columba’s Church supported Christian Aid Week this year by hosting an ecumenical coffee morning on Saturday 12 May, followed by a Big Brekkie on the morning of Sunday 13 May. Church members will also be helping with the door-to-door collecting during the week. It was lovely to have a surprise visit from one of our previous ministers at the morning service. 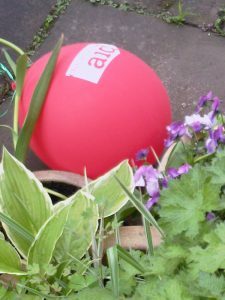 An ecumenical service was held at Christ Church on the evening of Sunday 13 May, describing some of the aid work carried out by Christian Aid and its partners around the world, rebuilding and transforming lives, working for justice, empowerment and an end to poverty. This year’s materials focussed on rebuilding after earthquake and hurricane in Haiti. 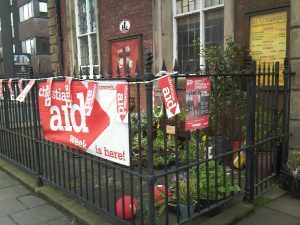 For more about Christian Aid Week 2018, see https://www.christianaid.org.uk/christian-aid-week. Happy Easter: Christ is risen indeed! At St Columba’s, we have celebrated Holy Week with a series of services and events. 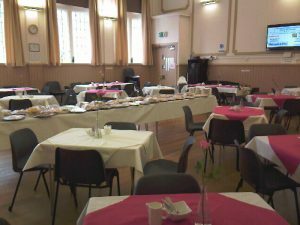 There was evening communion on Maundy Thursday, remembering the first Last Supper. On Good Friday, the weather stayed fair for Churches Together’s open air services and procession of witness from Northumberland Square to Bedford Street and back. We heard messages from civic guests, the story of the day from St Mark’s Gospel, and a time of silent reflection on Jesus’ last words from the cross. Messy Church followed in the church hall, with lots of Easter-themed craft activities. On Easter Sunday, we celebrated with three communion services, the early one being led by our Synod Moderator, Revd Dave Herbert, followed by a fairtrade breakfast. 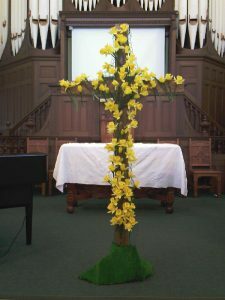 At our main morning service, we decorated a wooden cross with seasonal daffodils, and heard reflections on the three women finding the empty tomb on the first Easter morning. Christ is risen indeed, and accepting that can change our lives and change the world! 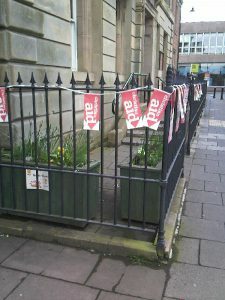 Mothering Sunday was a little different this year at St Columba’s. 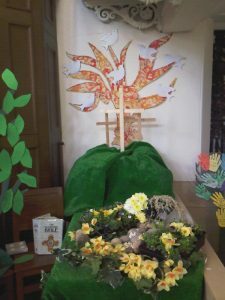 In our all-age morning service on 11 March, we began by thinking about the things that plants need to grow: water, sunshine and food. Then we reflected that we too need these things, along with love, time for each other, and sometimes to say sorry. As well as our human family tree, we also have a spiritual family, as we are baptised into the church of Christ, our Mother Church. 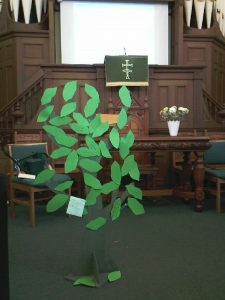 Reflecting on the image of Christ as the vine in chapter 15 of St John’s Gospel, we made our own “tree,” with deep roots, and people as branches, bearing leaves carrying our prayers for the world. We were reminded of our connectedness with all people, and encouraged to follow Jesus’ example by showing care, love, kindness, respect and patience. In this way, our tree can blossom as we make a difference in the world. In our church service on Sunday 14 January, a presentation was made to local cancer charity Daft as a Brush of the £750 raised at our Festival of Christmas Trees last month. The charity, which has 300 volunteers taking cancer patients to medical appointments in their distinctive minibuses, was thankful for this gift, and appealed for more drivers to help them do even more.